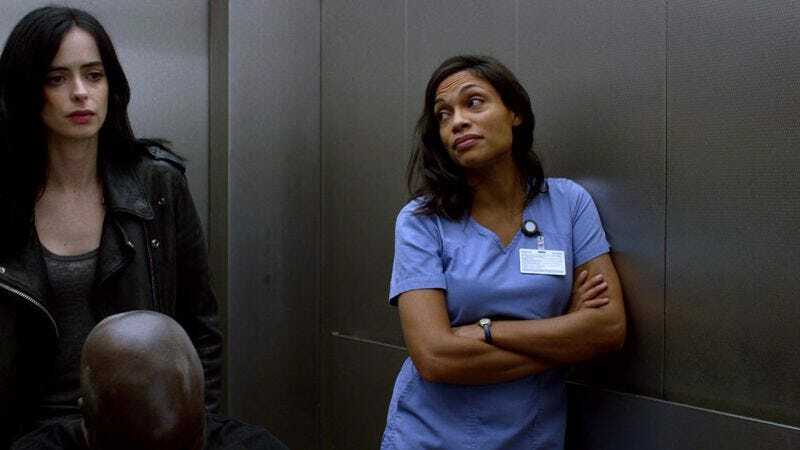 So far, the one constant throughout Marvel’s Netflix shows—other than hallway fights, older black men getting killed, and a bizarre refusal to say “Captain America” out loud—has been Rosario Dawson’s Claire Temple. She’s popped up on Daredevil, Jessica Jones, Luke Cage, Iron Fist, and she’ll appear in the upcoming Defenders team-up miniseries, but Collider is reporting that her streak will end with the upcoming Punisher series. Dawson says she “really wanted to do a cameo” on the show, but for whatever reason it just didn’t work out. That means Jon Bernthal’s Frank Castle will have to find some other exceptionally patient nurse to help stitch him up when he gets attacked by ninja assassins, but that nurse probably won’t be able to make vague references to a certain friend she has who is both a blind lawyer and a masked vigilante. In other Rosario Dawson news, Comic Book Resources is reporting that she went on Good Morning America recently and casually mentioned an online campaign to get her into a Star Wars movie. The pitch is for her to play a live-action version of Clone Wars hero Ahsoka Tano in one of the prequels/spin-offs, which could actually happen now that Star Wars Rebels has become weirdly hesitant to kill her off. There’s nothing officially happening with any of this just yet, but as everybody noted on Good Morning America, Star Wars does follow Dawson on Twitter.